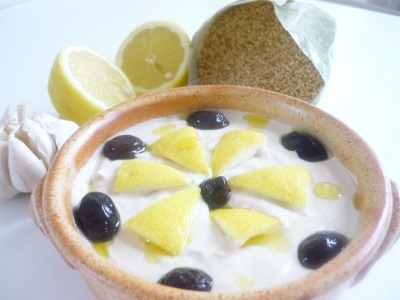 Tahini is a much loved sauce in Cyprus, made from sesame seeds. The roasted seeds are finely ground in a stone mill and end up as a thick paste, known as ‘tahini’. This paste forms the base of tahini sauce, which is popular in Cyprus (and less so in Greece) as a dip or side dish. Tahini is also often used in dishes such as the tasty and nutritious ‘tahinosoupa’ (tahini vegetable soup). In Cyprus, tahini paste is also used to make the delicious traditional sweet pastries known as ‘tahinopites’. Tahinopites, which combine two nutritious ingredients, sesame seeds and carob honey, are found in every bakery in Cyprus. We will soon be publishing a recipe for them, so check back for it! Nowadays you can easily find tahini in many stores outside the Greek world. If you can’t find it in your local supermarket, then you should be able to find it in health food stores or ethnic food stores. Here’s our tahini recipe for an easy way to turn the tahini paste into the well-loved sauce or dip.